Rachel Eash Scott is a family physician from Milwaukee who does obstetrics as part of her practice. 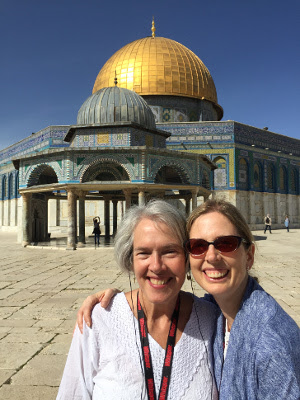 Rachel participated in an NPI-sponsored tour to Israel in March 2018 and she wrote the following reflection to share with the NPI community. “I was embarrassingly ignorant about the history of the land we call Israel/Palestine and I wasn’t sure what my trip there would entail. I was interested in learning more about Israel/Palestine and touring the lands I’d heard about in Bible stories, but I didn’t know much about the history or the conflict. It all felt so big and overwhelming and distant from my life in the States. I’d been invited on the tour by my aunt, Joan Kreider, also a physician. What I came away with was a great respect for the people of Israel/Palestine, for the complexity of the conflict, and for the loveliness of the land. One of our speakers introduced himself as a Christian Israeli Arab Palestinian and that for me summed up the beautiful and complex nature of the country. It was overwhelming at times to walk in the very places that Christ would have walked among people who likely looked very similar to what Christ looked like. It was also delightful to see people from all nationalities making their pilgrimages to the same sacred spots, to know that people all over the world revere this land as well. There were so many highlights on the trip: learning about Nazareth hospital and seeing Bob and Nancy Martin’s warm homecoming there; eating a Palestinian meal in the West Bank; meeting new friends; eating street food in Jerusalem’s Old City; standing on the Temple Mount looking over the Mount of Olives; walking the Via Dolorosa with our group and thinking about the millions of feet that have walked the same path. My aunt and I traveled wonderfully together and helped each other keep a sense of humor when things weren’t going perfectly. And now in recent weeks there has been a horrible outbreak of violence again in Gaza. There are no easy answers, no easy way forward to peace. But what I’ve learned is that the people of Israel/Palestine want peace, and that respect must be given to both sides in this conflict to bring peace to this holy land. Keep up to date with news from the Nazareth Project and stories from across our work in Nazareth and beyond. Nazareth Project The official registration of Nazareth Project, Inc. may be obtained from the Pennsylvania Department of State at 800-732-0999.